Last week a person I work with told me a story. He said things like ‘I stepped up when no one else would’, ‘the bullying had to end’, ‘in the nick of time’, ‘down to the wire’, ‘I got in his face’, ‘they picked the wrong guy’, and so forth. Last week I signed up for an online course in archaeology through Coursera. One of the first lessons was on terminology. What does that have to do with the opening paragraph? The word ‘context’. In archaeology, it refers to where something is found. Obviously that can tell you a lot more than the object alone. So the context of the opening paragraph? He’s an accountant type and was talking about a disagreement with an auditor. The context of the story dramatically changed my response. I’m enjoying the online course a great deal, but I keep getting distracted by how it ties in with writing. Think about the context of a story. Dialog, as with the accountant, changes dramatically depending on context. So does physical movement, internalizations, emotional reactions…well, pretty much everything in a story. And while this seems very obvious, at the same time I have to admit to rarely thinking about it. It’s so obvious I’m not sure I need to think about it. I mean, I know if a character says ‘Who said you could come in here?’ the line will have a completely different meaning if the character says it standing in the kitchen, to another person, or standing in the kitchen, alone, speaking to the fridge. Where I need to think more, and where I regularly fall short in writing, is context related to scene setting. If I have a character sit at a table, it’s not enough to say a ‘wood table’ or a ‘littered table’. Is the character sobbing? Then, context beefs that action up. Is there a box of tissues sitting conveniently next to her, or does she hold a crumpled corner of tablecloth? And that’s where I need to work more. The tiny material things that add to the context, bring depth to the character or scene, and that, on their own, might seem trivial but are, in actuality, vital to making writing original and believable. I tend to ignore the little things. At least until the editors point out my characters haven’t put clothes on for 200 pages. So, look around you and think about context. What is near? What does the context you are in, at this moment, say about you? What, in your proximity, do you value? And for you writers, do you remember the value of context, or do you, like me, forget? Look at the photo below. 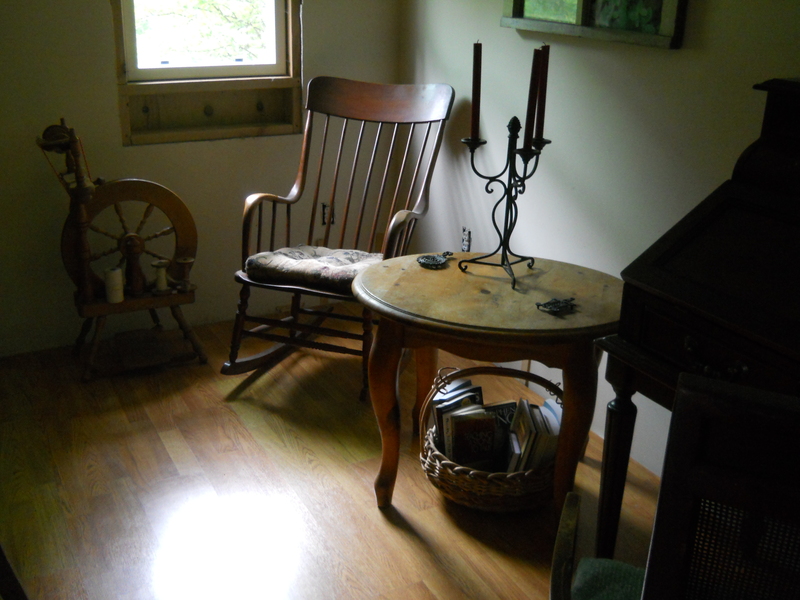 Would the rocking chair have the same significance if found alone, as it does found next to the spinning wheel? The context, the proximity, begs a story. Who sits there? Where did they go? What happened to interrupt? The chair by itself, I think, would just look lonely. Writing space continues to improve. the floor that got installed… yeah, how about telling the people too that YOU were the one installing it??? Tsk! I love the picture because every piece in it could have its own story…together they hold just so much potential. You actually told me about context before in my writing, so it is in your mind. I love your writing space. We had a spinning wheel like that in our living room when I was a kid.